Today, Breyer revealed Darjeeling, the 8th BreyerFest 2017 Special Run! He is the old Chris Hess Semi – Rearing Stallion or Diablo mold. My guess that he would be the Fighting Stallion mold in my last blog post wasn’t quite correct =p Darjeeling is a gorgeous glossy bay semi-leopard appaloosa that was designed by artist Sommer Prosser. I am a big fan of Sommer’s art work and feel that she designs some of Breyer’s very best colors! Darjeeling is named after the West Bengal are of India that is most noted for its tea industry and the Darjeeling Himalayan Railway. Let’s start off the weekend by meeting Darjeeling! Darjeeling is on Chris Hess’s semi-rearing mustang mold (number 87) from the 1960’s. Darjeeling is a richly-shaded bay semi-leopard appaloosa with a star, snip, a single sock, lighting marks, and mottled skin. This latest Special Run model was expertly designed by Sommer Prosser. Darjeeling is a region in the West Bengal area of India and is most notable for its tea industry and the Darjeeling Himalayan Railway, which is a UNESCO World Heritage site. Settled by the British during the colonial period in the mid-19th Century, this city is a melting pot of Indian and British traditions. 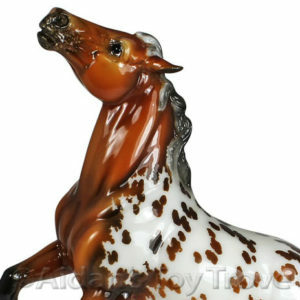 This Breyer Darjeeling is named so because of his tea-stained coloring and his patterning reminded us of a snow-dappled mountain top, much like stunning views of Kangchenjunga in Darjeeling. « BreyerWest 2017 Here We Come!